Designed and built prior to the First Galactic Civil War by the now-defunct Aeroship Recreational Design Corporation, these flashing fixtures of routine revel and refreshment were once standard sights hovering above spaceports and near space stations. 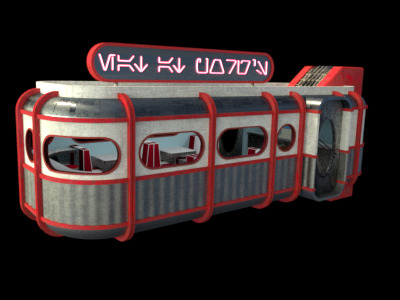 The spread of station-side fast food chains undermined the market for the Spacelane Diner, but many of these neon studded star-restaurants remain as nostalgic reminders of an earlier era of space and culinary history. The ship's glitzy facade masked the fact that it was little more than a chintzy box with a simple docking port, a few repulsors and a primitive sublight engine. It carried no hyperdrive or weapons, with just enough shielding and armour to protect customers from the dangers of the vacuum or atmosphere beyond its walls. The ship was not designed with a bridge or cockpit; any required manoeuvring would be handled via a small wall panel near the main cash register. 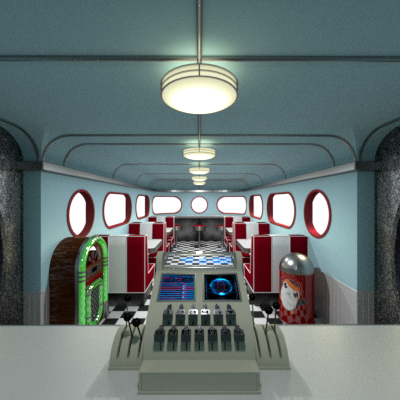 Surprisingly, the Spacelane Diner carried a relatively robust sensor suite, a concession from designers who realised that operating a slow moving, fragile box in the sky might be easier if the "pilot" could clearly see the outside of the ship. These sensors inadvertently became a useful feature for spotting potential customers. To keep costs low, Spacelane Diners used pre-fabricated kitchens, with several standard layouts available to match the culinary and nutritional requirements of the restaurants' diverse clientele. Despite the wide variety of available models, one edition dominated sales and featured several fryers and a griddle for preparing standard breakfast foods and bantha burgers.